This exercise serves to loosen the shoulder and hip joints. We do this by guiding the movement from the lower part of the body and directing it all the way to the finger tips. 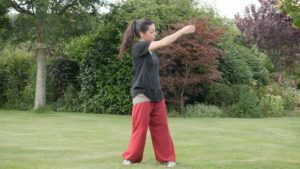 When practicing Qigong it is important to be soft in the body, but it is also important to be connected. If we can keep the body relaxed, it is easier to feel and make connections so we are able to guide internal movement. Begin with feet apart and the body relaxed. Sink the weight, feeling the feet on the ground. Allow the breath to sink to the belly and let it slow down naturally. Feel the shoulders soften and allow the arms to become light. Without shifting the weight too much, twist the hips from side to side. Allow the torso to move naturally with the hips. The shoulders should stay more or less in line with the hips. There is almost no twist with the spine. Feel the shoulders and arms completely loose and relaxed. Let the movement of the body carry the arms from side to side to swing around the mid section of the torso. The arms should be soft enough to gently tap the sides of the torso. Without stopping, guide the arms so the front arms can raise up and tap the shoulder. Next, continue the movement with a greater shift of the weight. Bring the arms back down to swing around the mid section of the torso. As the body twists to the left, shift the weight to the right foot. Pivot the left foot on its heel to turn the left toes out. Keep the hips level (horizontal). As the body twists to the right, shift the weight to the left foot. Pivot the right foot on its heel to turn the right toes out. Keep the hips level. Gently, allow the arms and the body to come back to rest. When performing this exercise try not too forceful. Sink the weight through the legs and feet. Keep the body relaxed and breath!